We believe, Quality is a fundamental need and of paramount importance for all pharmaceuticals. This has propelled us to implement an effective Quality Management System, which is guided by our Quality Policy. We remain committed to continuously strive for higher Quality goals and rigorous implementation. Commitment to total customer satisfaction by manufacturing and supplying quality products. Following Good Manufacturing Practices norms in manufacturing and delivering quality products. Stringent checks to ascertain compliance with statutory & regulatory requirements. 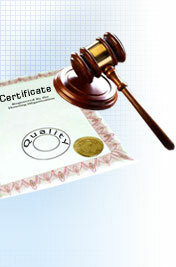 Maintaining an effective Quality Management System. Involving employees & suppliers to maintain the effectiveness of quality management system. Continual improvement in the effectiveness of our business operation systems.  ISO 9001:2000 awarded by BVQI in December 2004. Applied for WHO:cGMP in Feb 2005. 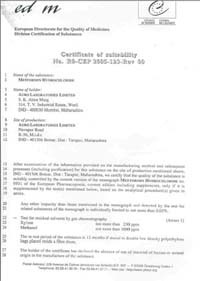 Received CERTIFICATE OF SUITABILITY(COS)from the European Directorate of Quality Medicine (EDQM)in September 2006 vide Certificate No.R0-CEP 2005-123-Rev 00. Copyright © Auro Laboratories Limited, 2005. All rights reserved.